Regardless of whether your sister-in-law is your best friend or your arch enemy, she is an integral part of your family. That’s we’ve made this list of 210 birthday wishes for sister-in-laws. 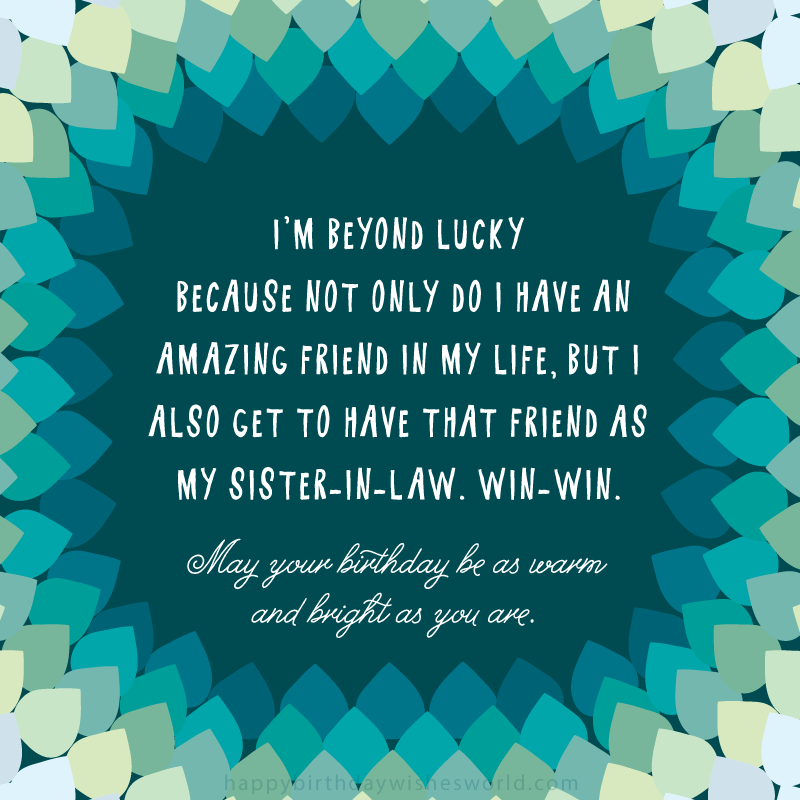 If you are struggling to find the perfect way to say happy birthday sister-in-law, then here is a compilation of well-wishes to help inspire you. 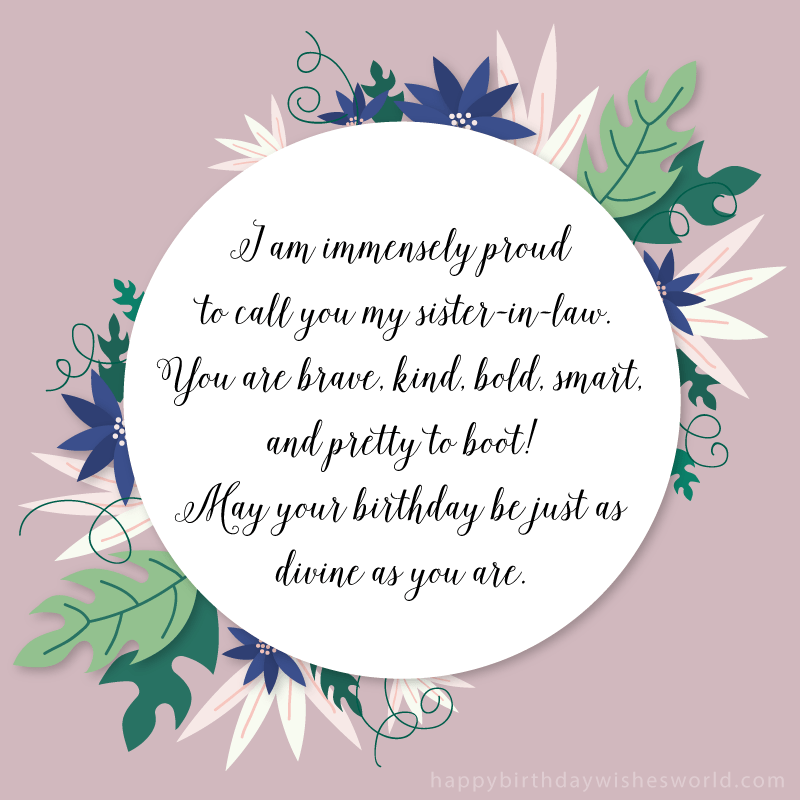 It doesn’t matter if you are looking for poignant or witty, older or younger, or if it’s from a brother-in-law or a sister-in-law because this list covers all the bases and has only one goal in mind: wishing your sister-in-law a happy birthday. People often refer to you as my sister-in-law or my brother’s wife when talking to me, but I like to refer to you by your other title: my friend. I hope your birthday is fun and fabulous like you. As my sister-in-law, you have only ever shown me warmth, and I am always moved by your incredible capacity for kindness and love. I sure lucked out when you married into my family, and I am all the better for having you in my life. Happy birthday Sister-in-Law! Such a lovely person deserves an even lovelier birthday. May it be that and so much more this year. Thank you for being not just a wonderful in-law but a wonderful person as well. I am so ecstatic that you have become a member of my family. May your birthday bring to you all the wonderful things that you have ever wished for in life. Happy birthday! If you drop the in-law part of sister-in-law, then you will have what I really consider you to be: a sister. I am so grateful that I am blessed with another sister in my life, and I hope you can consider me to be your sister as well. May your special day be full of luck, laughter, and love. Since I have such a large family, I have no shortage of in-laws. But the one in-law that I can always turn to for advice, support, and love is you. I am so glad that you are a part of my life, and I hope that your big day is full of cheerful people, cool presents, and chocolate cake. My brother has done a lot of stupid, crazy things in his life, but marrying you was not one of them. In fact, it might be the only smart thing he has ever done! Thank you for becoming a part of our family, and may you have an enjoyable birthday full to the brim with hope and delight. Sister-in-Law, I was trying to think of the perfect gift to give you for your birthday, but then I realized that you already have the best gift: me as your brother-in-law. I couldn’t possibly top that, so I went for chocolate cake instead! I hope your every wish comes true this year for your birthday. I know it’s possible, because when I was a kid I always wished I had a sister, and now I have you in my life. Happy birthday Sister-in-Law! Some people aren’t fond of their in-laws, and I can’t help but feel sad for those people. They weren’t fortunate enough to have an amazing sister-in-law like you in their lives. Thank you for enriching my life with your compassionate and loving ways. Whenever your birthday rolls around it fills me with joy and delight to know that someone so wonderful and caring is part of my family. I am sending lots of warm and loving thoughts your way today. Happy birthday Sister-in-Law! The day my brother married you I was nearly overcome with joy. Finally, he managed to do something right with his life! Just kidding. Sort of. 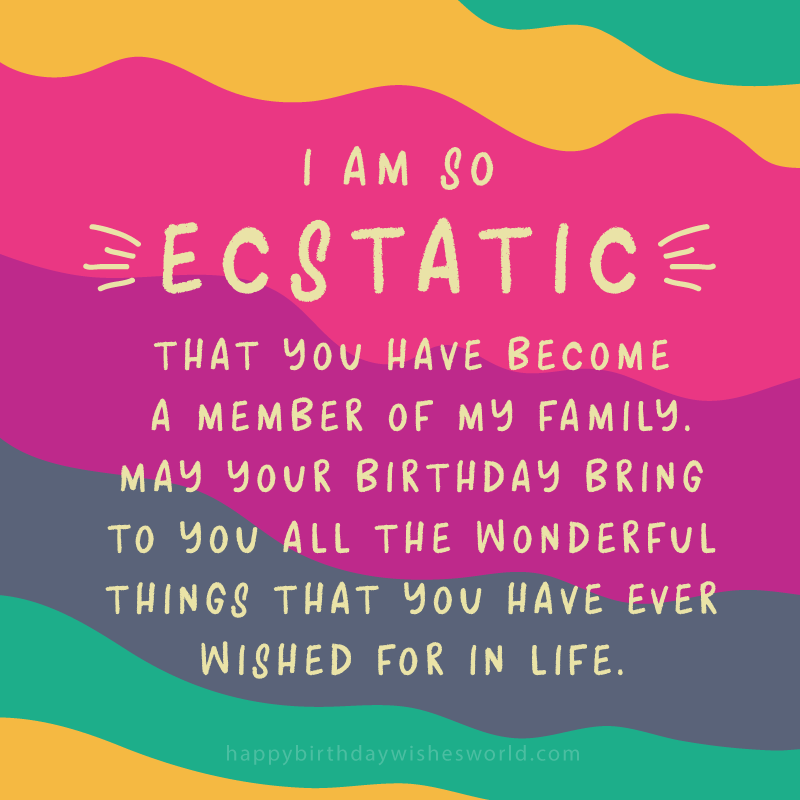 I am delighted that you are my relative, and I hope your big day is as wonderful as you are a person. I’m beyond lucky because not only do I have an amazing friend in my life, but I also get to have that friend as my sister-in-law. Win-win. May your birthday be as warm and bright as you are. Thank you for making our family stronger by being in it. You are a loving wife and an amazing friend. I am so blessed to have such a genuine and sweet person as a sister-in-law. Sister-in-Law, you have done the impossible. No, not just keeping my brother in line (although good job on that miracle), but you have managed to make family get-togethers tolerable! Your quick wit, charming grace, and adorable demeanor always brighten up our family functions. I am so glad that my husband has such a phenomenal sister. When I first married him, I looked forward to romantic dates with him, but now I also get to look forward to coffee dates with you! Thank you for always treating me like a sister and a friend. Happy birthday! Thank goodness my brother picked you to marry! I can’t even imagine not having such a charming, fabulous, gorgeous, and incredible person in my life. May your big day be everything you want it to be and more. Sister-in-Law, I just wanted to take today to thank you for fulfilling a dream I have had since childhood: having a sister. I am so happy that we are close, and I hope we always stay that way. Sister-in-Law, you have always gone out of your way to include me in your life, and I want you to know that I appreciate you so much. Your caring, warm, and generous nature has warmed my soul. May your birthday be a momentous, joyous, and prosperous occasion. The day my baby brother married you was the day I decided to forgive him for a lifetime of being annoying. Thanks for loving him as much as I do, and for being an amazing person. Sister-in-Law, you may be your parent’s beloved daughter, my brother’s treasured wife, but you are also my best friend. Thank you for bringing so much joy and happiness into all our lives. May your birthday be meaningful and bright. Happy birthday! Over the years you have always touched me with your ability to make others laugh. Your addition to our family has enhanced our lives in so many delightful ways. Thank you for being such a positive and bright person, and may your birthday be spectacular. When my older brother married you, I was worried he wouldn’t have time for me anymore. But I couldn’t have been more wrong. In fact, we are closer than ever, and instead of losing my brother, I have gained a new friend. Thank you, and happy birthday Sister-in-Law! I’ve always criticized my baby brother’s choice in women, but when he met you, I was elated. I knew right away you were an extraordinary person, and I am so glad that he somehow tricked you into marrying him! I hope your birthday is as joyous and sweet as you are. May your special day be full of astounding discoveries, magical moments, and lovely surprises. You deserve all these things and more. Happy birthday to an incredible woman: my sister-in-law. I wish you many things for your birthday this year, Sister-in-Law: lots of money, health, and happiness are just a few. Although, if you do get lots of money, keep in mind that your amazing sister-in-law made that wish! Happy birthday to my hopefully soon-to-be wealthy sister-in-law! Sister-in-Law, you have made not only my brother extremely happy but me as well. You are an affectionate, endearing, and inspiring person that we are both lucky to have in our lives. May your birthday bring you nothing but satisfaction and wonder this year. I adore you as a person, confide in you as a friend, and love you as a sister. You make my life better with your presence, and I hope that you always feel surrounded by peace and love. Happy birthday to the woman that I cherish like a little sister: my adorable sister-in-law. I see now that intelligence, cuteness, and prettiness run in the family, and I am so happy that not only do I have an amazing wife, but an amazing sister-in-law as well. Sister-in-Law, I know that I can always rely on you. No matter the issue, you are a constant source of help and support. Thank you for being such an understanding and generous person, and I pray that your birthday is as warm, bright, and wondrous as you are a person. Over the years you have given me so many reasons to smile, and I hope that on your birthday you never stop smiling. You bring warmth, happiness, and joy to everyone around you. May your belly be full of cake, your hands full of presents, and your heart full of compassion, happiness, and joy. Happy birthday to my phenomenal sister-in-law! You are an incredibly lucky woman, Sister-in-Law. You have a terrific husband, awesome kids, and me for a sister-in-law. But no one is luckier than I am because I get to have you as my best friend. Happy birthday! I am so grateful that I have such a splendid sister-in-law. I hope that your birthday is as extraordinary as you are and that our bond continues to grow stronger every year. Sister-in-Law, our relationship is a lot like Toy Story in that “You’ve Got a Friend in Me.” I never think of you as an in-law, because to me you are simply my friend. Happy birthday! My brother is known for many things but making stellar choices is not one of those things! Which is why I was flabbergasted when he picked such an exceptional person to spend the rest of his life with. This just cements my belief in dumb luck! When I think of you, I can’t help but be amazed by how kind and generous a person you are. I’m so lucky that you’re a member of my family, and I hope that you have an exceptional birthday. May you be as happy on your birthday as I am to have you as a sister-in-law. Which is to say, immeasurably. You are a wonderful addition to our family, and we wish you happy birthday! After I met you I realized something: my wife must have learned her tenacity, strength, and charm from her older sister! Thank you for being a spectacular sister to both of us. I was so worried about how you would impact my brother’s life that I was blind to how you would impact my own life. You have made such a deep and meaningful impression on both of us, and I am fortunate beyond belief to be related to such a remarkable woman. Sister-in-Law, I’m equal parts jealous and admiring of you. I am jealous of how perfect you are, but I also admire that about you. More importantly, I love and adore you to pieces! I am so grateful that I have you as a sister-in-law. How else would I be able to learn all my brother’s secrets? Thanks for sharing more than friendship with me and for always treating me as a friend instead of just an in-law. Happy birthday! When my brother got married, it was such a welcome surprise to find out his wife had a sister. This way I got, not one, but two new sisters! Happy birthday to my superb sister-in-law! Sister-in-Law, I want you to keep in mind that my brother inherited all his good traits from me. So you have me to thank for him being so awesome. Just keep that in mind when you are divvying up your birthday cake is all I am saying. Happy birthday! Even though we are related by law, it feels like we are related by blood. I love you so much, and I am deeply grateful that such an incredible person came into my life. Happy birthday Sister-in-Law! Sister-in-Law, my brother and I have always been so close, and I will admit I was anxious when he married you. But I want to thank you for never being jealous of our closeness, and for always encouraging us to stay that way. Happy birthday to the glue that holds this family together! You have been such a sweet and wonderful sister-in-law, so today I wanted to tell you thank you. I am glad you were born, and that you came into my life and filled it with light and love. If sisters-in-law were Pokémon, you would be Pikachu: aka the very best. May you always win your battles in life and catch all your dreams. Happy birthday from your nerdy brother-in-law! The best thing about having you as a sister-in-law is that we didn’t have to suffer through that awkward growing up together stage. Instead, we got to skip straight to the good part: being friends. Happy birthday to my “sister” and friend! Sister-in-Law, you always seem to be on top of everything, and you never seem to age. It’s like you are a magician. So, can you do me a huge favor and make my brother disappear? Thanks! I don’t need Facebook to remind me that it’s your birthday, Sister-in-Law. Who could ever forget such a talented, intelligent, and beautiful woman’s birthday? May your day be truly spectacular. Here’s wishing that my astounding sister-in-law has a birthday that is as special as she is to everyone she knows. You are a delight to be around, and our whole family is grateful that you have become a part of us. Happy birthday! I wish you fortune, treasure, and wealth this year for your big day, Sister-in-Law. You may have noticed a common theme with this wish, but I promise that it’s for a good reason. I really, really need you to buy my brother some common sense this year! Just kidding, and happy birthday! Sister-in-Law, you seem to have a special gift in life: attracting positive, amazing, and good-looking people. First my brother, and now me. You are certainly lucky. Although to be fair, you are all those things too! Happy birthday from one amazing person to another! May you continue to be as successful as you are now, whether it is in work, love, or happiness. You are a tremendously cool person, and I am lucky to be related to you. Happy birthday Sister-in-Law! I know that deep down you are secretly pining for me and married my younger brother to be close to me, Sister-in-Law. At least, that’s what I tell myself because the concept of someone actually liking my little brother is too hard to fathom! Happy birthday to my secret admirer! Sister-in-Law, I think my kids might love you more than they do me! Thank you for being not only a sister to me but a wonderful aunt as well. May your big day be full of happiness and joy. For me, the best thing about your birthday is the fact that I get to hear your laughter all day long. It warms my heart because you are a lovely addition to our family. Happy birthday! I couldn’t have asked for a better sister-in-law, because you are calm, cool, and captivating. How my brother managed to trick you into marrying him is still a mystery to me, but I am glad you fell for whatever it was! Happy birthday to my remarkable sister-in-law! Sister-in-Law, even though you are way out of my brother’s league, I am grateful you married him, because otherwise, I would have missed out on having such an amazing and invaluable friend. Thank you, and happy birthday! When I was a kid, I always complained about the fact that I didn’t get to have a sister. But now that you are a part of my family, I have found the sister I always wanted in you. Thank you. Sister-in-Law, I want to congratulate you for surviving another year with my brother! That’s a truly remarkable feat, and I hope that your birthday is as astounding as you are. I tried not to have any expectations when my brother married you, but it didn’t matter because you exceeded all of them anyway. You are darling, dazzling, and delightful. May your birthday be even half as dear as you are to me. Happy birthday Sister-in-Law! Sister-in-Law, we may have had a rocky start to our relationship, but what counts is that we got there in the end! Now, there is no one else I would rather turn to for friendship and advice than you. I hope that you have an incredible birthday that is as lovely as you are. Don’t tell your brother, but the reason I married him was so that I could have you as a sister-in-law! Just kidding, but I am grateful that I get to be a part of your family. Happy birthday! Sister-in-Law, my memories of you are always bright and warm. You are one of the most incredible women I have ever had the privilege of knowing in life. I am so thankful that I get to be related to you, and I sincerely hope that you have a terrific birthday. Happy birthday to the only woman brave enough to marry my brother! You are my hero. May your birthday delight you and your joy be immeasurable this year. Thanks for providing me with one of the greatest gifts I have ever been given: nieces and nephews. They bring me just as much joy as you do. Happy birthday to my beloved sister-in-law! Sister-in-Law, there are several things that I want to take the time to thank you for: for always letting me confide in you like a real sister, for comforting me when life wasn’t going my way, and for loving me as much as you love my brother. I am eternally grateful to have you in my life. Happy birthday to my favorite shopping buddy and gal pal. If I had known how awesome it was going to be having you as my sister-in-law in the future, I would have been a lot more excited about having a baby brother growing up! Just kidding. Maybe. I know that my brother treats you like a queen, so instead, I will treat you like a princess. I plan on spoiling the mess out of you on your big day, Sister-in-Law. Prepare for lots of cake and wine from your adoring brother-in-law. Happy birthday! Sister-in-Law, family gatherings are way more exciting now that you are here. You are an absolute pleasure to be around, and I am so lucky that I get to spend time with such a sassy, smart, and spontaneous woman. Happy birthday to my spectacular sister-in-law! It boggles my mind that there are people who don’t like their sister-in-law. But they must not be blessed with a considerate, loving, and supremely likable sister-in-law like I am. I am grateful that you are a part of my family, and I hope that you have a marvelous birthday. At first, I was intimidated by how fabulous and amazing you are. But then I became grateful because you passed on so much wisdom and love to me. Thank you for always being kind and treating me well. My brother is so lucky that he has you as a wife. Happy birthday Sister-in-Law! Now that I have a splendid sister-in-law like you, my brother doesn’t have to worry about spoiling me. You have taken over that job, and I must say you are doing it phenomenally. Thank you for showering me with your love, and I hope that you feel just as loved on your big day. When I was younger, I was glad that I only had brothers, but now that I am married to your sister, I am grateful that I now have a sister to love and dote on as well. I could never have imagined how wonderful it would be to have you in my life. Happy birthday, Sis! My brother really lucked out when he met you, but it’s our whole family that has benefited the most from you. You have brought peace, joy, and happiness to us, and we are so grateful that you are a part of our lives. May your birthday be filled with fun, laughter, and a massive cake. I always wondered how my husband came by his genuine, loving, and respectful ways, and now I know: he grew up with an amazing older sister who taught him to treat women with respect. Thank you, and happy birthday! Sister-in-Law, your birthday is a truly momentous occasion. Not only is it a celebration of the day you were born, but it is a yearly reminder that you deigned to say “yes” to my baby brother and became a member of our family. Thank you for keeping him sane and for treating me as a sister. Having an amazing sister-in-law is much more important than having amazing friends. Mainly because during the holidays you can choose not to spend time with your friends, but family not so much! I’m grateful that I get to spend my holidays with you and I wish you a happy birthday! I am so thankful that you found your way not just into our family, but into our hearts as well. You always bring a smile to our faces, and we are blessed to have you in our lives. Some women really resent their sister-in-law, but I am overjoyed that you have captured all my brother’s attention. Now, if you could just work on doing the same thing with my parents that would be great because I need them to be distracted from all the trouble I like to cause! At first, I was anxious about how you would affect my relationship with my brother. But now I realize that I was incredibly stupid because it’s only gotten better now that you are included! Happy birthday to the person who complements my life: my sister-in-law! Your birthday is an incredibly important day, Sister-in-Law. It’s a day to reflect on how wonderful it is that you were born because, without you, our lives wouldn’t be nearly as happy and wondrous as they are now. We are so lucky to have you as part of our family. I’m often jealous of my brother because he gets so much of your time. He should really share you more! Happy birthday to my magnificent, spectacular, and marvelous sister-in-law! Thank goodness you married my brother, because now you can take over the job of spoiling your nieces and nephews. He does a great job, but I know that you are going to be even better at it because I’ve experienced being spoiled rotten by you first-hand! Happy birthday to a woman who deserves to have her every command followed and every desire fulfilled: my sister-in-law. For all the years you had to put up with my husband during his childhood, you deserve this and so much more! May all your wishes come true this year. Sister-in-Law, I never believed in luck until I met my wife and she turned out to be perfect. And then, to top it off, she had a perfect sister too! How did I luck out this much? Happy birthday from a converted believer! Bring on the leprechauns and rabbit’s feet. No gift could ever compare to the one you have given me: family. Thank you for being an incredible wife, a marvelous mom, and a fantastic friend to me. Happy birthday! My husband is often jealous of our relationship because he thinks you love me more than him. I always tell him that’s not true, but between us, we both know that I’m the better sibling! No need to let him know that though. May you have a truly extraordinary birthday this year. I’m touched by how open, honest, and loving you are. The day you married into my family I gained more than an in-law, I gained a friend. Happy birthday to my amazing sister-in-law! Now that my brother is married, he seems to have lost his spot as the family favorite. I’m not sure if my parents or I love you more, but either way, good job uprooting my brother! Thank you, and may your birthday be full of scrumptious food and delightful people. My wife is many things: talented, charming, adorable, and delightful. I think it must run in the family because you are all those same things! I am so grateful that I married into such a beautiful and loving family. Happy birthday, Sister-in-Law! Here’s wishing you lots of health, wealth, and love for your big day. Health so that we can have many years of get-togethers, wealth so we can shop a lot, and love because you are a wonderful person who deserves unlimited love. Sister-in-Law, we may not always get along, but we always respect one another. I hope you know that I appreciate all that you do for our family and that we only grow closer as time goes by. May you have a sublime birthday full of cake. Happy birthday! Life is full of surprises, including the best one where you and I became the best of friends. That was probably the best surprise of them all. Happy birthday, Sister-in-Law! I am so jealous that my older brother has such an amazing person in his life. How did he get so lucky in meeting you? If only you had a brother! Oh well. I hope you have a good birthday anyway, and that you receive countless presents, yummy food, and a super chocolatey cake. No gold or treasure could ever compare to you. Your friendship, loyalty, and advice are truly priceless, and I pray that your special day brings you as much contentment as you have brought to me over the years. Happy birthday Sister-in-Law! Sister-in-Law, I don’t know who loves you more my brother, my kids, or me. It’s a tough competition, but I like to think that I’m winning! Happy birthday to my loved sister-in-law! Thank you for always loving and taking care of my brother (you deserve a medal for that by the way), and for always doing the same for me as well (probably much easier to do). You are unbelievably kind and generous, and we are both lucky that you are a part of our family. I am so glad that my brother married you because now my children have an amazing role model in their lives. With just my brother, I was worried there for a little bit! Just kidding. He’s a great role model too. Happy birthday to my perfect sister-in-law! Sister-in-Law, you have always treated me with kindness and respect like a real sister. I am so fortunate that my brother married such an astounding woman, and may your special day be filled with grace, compassion, and love. For your first birthday as part of the family, I thought I would go out of my way to make you feel welcome. So, here is an entire album of my brother’s ugliest pictures. You are welcome, and I hope that your big day is tremendously fun. Happy birthday! There’s not a day that passes by that I’m not thankful you came into my life. You’ve brought peace and love, not just to my brother, but to me as well. May your birthday be just as memorable and loving as you are. I’m glad that you have become my sister-in-law because now Mom and Dad can harass you for grandbabies instead of me! You have my heartfelt gratitude and love. Happy birthday! Now that you are my sister-in-law, I finally have someone that I can turn to for sisterly advice. I have been waiting for this day for a long time! Thank you for marrying my brother, and may your birthday be as meaningful to you as you are to me. I’m not sure what possessed you to marry into our family, but I am overjoyed that you did! Thank you for losing your mind, and may it always stay lost. Happy birthday to my crazy and beloved sister-in-law! May your life be full of only joyous and tranquil moments. And if that isn’t possible, may it at least be full of lots of wine, chocolate, and bubble baths. And in that spirit, I have brought you the biggest chocolate cake I could find. Happy birthday Sister-in-Law! There might be times when we argue and fight, but there are just as many times that we comfort and support one another. That’s what real “sisters” do. Happy birthday, Sis! Sister-in-Law, if you ever need someone to confide in, please turn to me. Especially if it concerns my brother, because I need all the dirt I can get on him! Just kidding. But know that I will always support and love you as if you were my biological sister. May your birthday be full of sparkle and delight (or at least something sparkly that brings a lot of delight) because you always delight me with your charm, grace, and wit. I am incredibly happy and grateful that I have such a wonderful sister-in-law. Sister-in-Law, I need you to stop being so darn perfect, because you are making me look bad! I need you to start having more flaws so that you can fit in better with our family. I know it’s hard for you but just try. Happy birthday to my flawless sister-in-law! A good husband is amazing of course, but a good sister-in-law is the icing on the cake. Thank you for being such a thoughtful and kind person. May your presents be covered in bows, your cake covered in icing, and your soul covered in love. Sister-in-Law, you have a very special place in my heart. Not just because you are a gorgeous, delightful, and charming person (which you are), but also because you have somehow managed to make my baby brother less annoying. Thank you, and happy birthday! When you married my brother, you went out of your way to try and forge a friendship with me. I am so thankful for that, and I want you to know that I appreciate and love you so much. Happy birthday to my sister-in-law who is as much a friend as she is family! Sister-in-Law, whenever you need a big brother to pummel someone for you just call me. Even if it’s my own brother that needs it. Heck, especially if it’s my own brother. He needs a good smackdown now and then! Just kidding. Happy birthday from your very protective brother-in-law! May your birthday be wonderful, your year prosperous, and your life successful. If anyone is deserving of this, it is you. Your determination, fortitude, and strength of character are unrivaled, and I am truly blessed to be a part of your life. Over the years I have come to rely on you for so many things. But it’s when I realized that I come to you for advice on love, that I finally understood that we had become true sisters. Thank you for your constant support and love. Happy birthday, Sis! I can completely understand why my brother wanted to marry you, but what I can’t comprehend is why you would ever say “yes” to him! Just kidding, but my brother is indeed lucky to have you in his life, and so am I. Your dedication, determination, and daring inspire me to aim higher, be bolder, and love stronger. I am blessed to have you as a role model, not just for me, but for my daughters as well. Happy birthday from your awe-inspired sister-in-law! My brother is the luckiest guy on the planet because he somehow found a woman who not only puts up with his crazy but is crazy in love with him as well. I am overjoyed at having you as an in-law, and I wish you all the happiness and joy possible on your big day. I am so thankful that we get along so well because it really helps to have someone who takes my side when arguing with my brother! Thanks for being feisty, fun, and fabulous (and for always keeping my brother on his toes). Happy birthday Sister-in-Law! 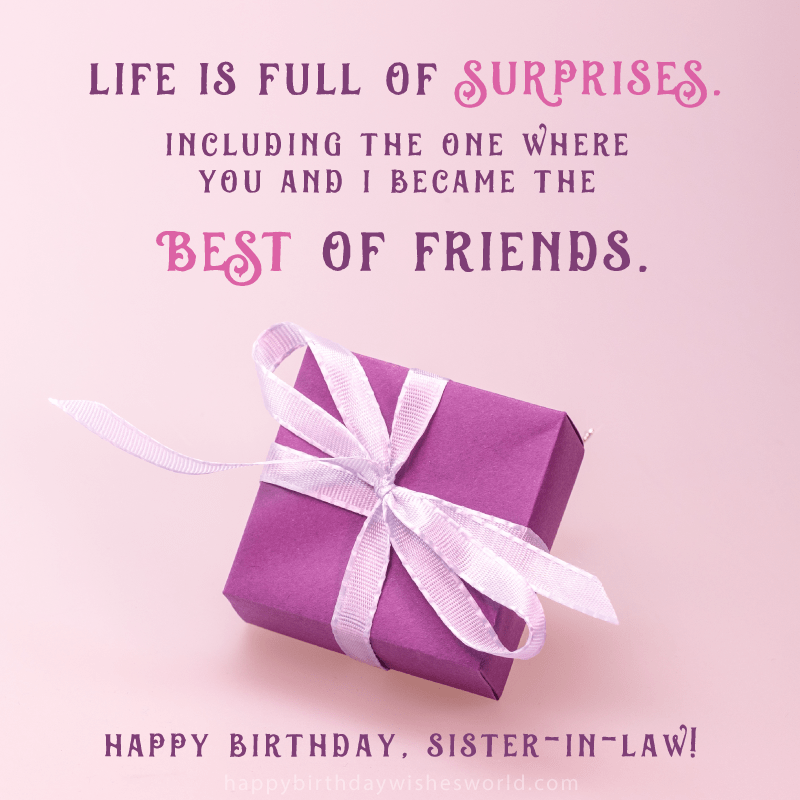 Sister-in-Law, I hope that every wish and dream you have comes true on your birthday. Since I know that you wished for a superb sister-in-law and dreamed of a colossal cake, I have provided you with both! You’re welcome. I will always cherish and adore you, Sister-in-Law. You are the sister I never had growing up, and I am truly delighted that you have always made every effort to connect with me. May your special day be full of priceless moments and loving people. Happy birthday! When I hear people talking trash about their in-laws, it only makes me more grateful that I have a kind, charming, and engaging sister-in-law. Thank goodness I lucked out in that department! I hope you have a stress-free, sensational, and superb birthday. Sister-in-Law, you are so perfect that I am convinced that my brother must have bribed you to marry him! It’s a good thing he did though because you have brightened my life with your exceptional love and devotion. Thank you, and happy birthday! 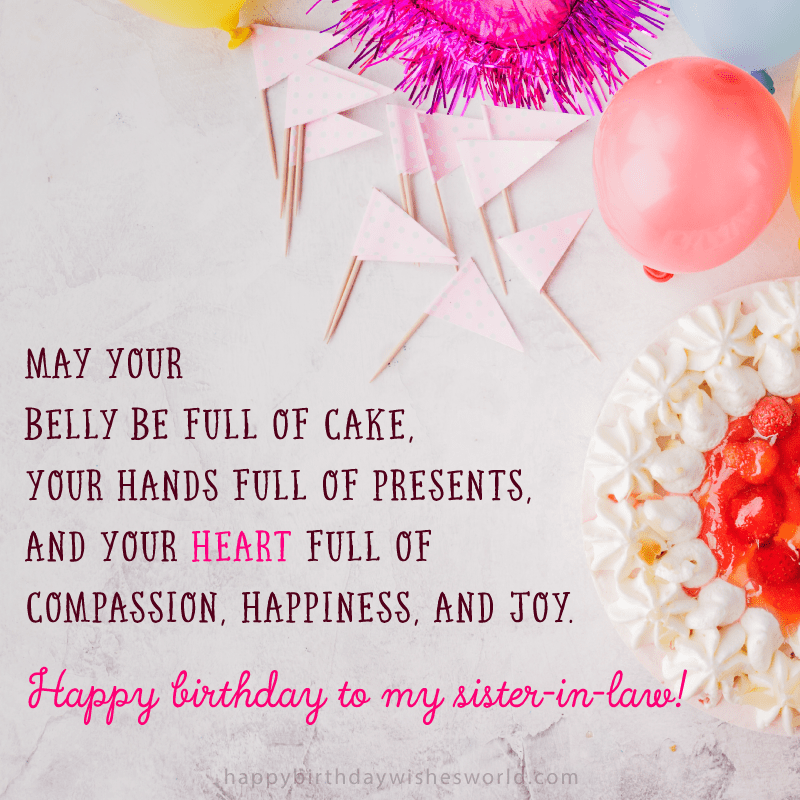 There are many things I wish for you on your special day, Sister-in-Law: may you have a day that is half as enjoyable as you are, may you have a spectacular cake that puts all others to shame as you do, and may you feel as much love as you have given throughout your life. Sister-in-Law, you are always so generous with your time, your affection, and your love. Thank you for always sharing and giving even when there were times when I was unworthy. I consider you more than an in-law; I consider you my sister. Happy birthday, Sis! Thank goodness my brother married you, because now I finally stand a chance of receiving decent presents for Christmas and birthdays! He normally is the worst, but now he has you to turn to, and no one gives better advice than you do. Happy birthday Sister-in-Law! I hope that you’re blessed with abundant love and joy this year and every year after. No one deserves it more than you, because you’ve survived living with my brother all this time! At first, I thought I would end up hating you, but now, I realize I have ended up loving you more than I ever thought possible. You are an amazing woman, and I can see why my brother picked you as his wife. Happy birthday to a remarkable woman: my sister-in-law! Sister-in-Law, you are one smart cookie, and I want to thank you for always taking the time to share your wisdom and knowledge with me. Although, you might not be too smart, because you did marry my brother after all! Happy birthday to my smarty pants sister-in-law! Thank you for always making me feel like I’ve got a handle on life, even when I really don’t. Your support is appreciated, and your love is reciprocated. Happy birthday! I am glad that we have such differing views, because who wants a carbon copy of themselves as a friend? You are a phenomenal person, and I want to thank you for being my friend despite our differences. Happy birthday, Sister-in-Law! I’m beyond excited that I married your brother because having a sister has always been a dream of mine. May your birthday be full of excitement but your life full of tranquility. I am immensely proud to call you my sister-in-law. Who wouldn’t be? You are brave, kind, bold, smart, and pretty to boot! May your birthday be just as divine as you are. Sister-in-Law, while it’s true you are a very likable person, it’s your feisty wit, endearing spirit, and loving nature that really take the cake. Speaking of which, I hope you have an amazing birthday that is topped only by how amazing your cake is. I’m so happy that you married into our family. Not only did I gain a sister, but an ally as well. Thank you for being on my side, pointing out my good attributes, and always making sure my brother buys me nice presents. You’re the best, and I hope you have a delightful birthday. When I was younger, I never wanted to get married, but after seeing how wonderful you and my brother are together, I have changed my mind! You make it look sublime, and I am so glad that you are now one of my family members. I hope you have a marvelous birthday. Sister-in-law, I like you so much that my husband often wonders whether you are more of a sister to him or me. I think he’s just jealous that clearly you like me more! May your special day be full of abundant love and happiness. Many people only ever have negative things to say about their in-laws, but I find that I only ever have positive things to say about you. Probably because having you as an in-law (and as a friend) has been one of the most positive things in my life. Happy birthday Sister-in-Law! Sister-in-law, since it’s your first birthday as part of our family, I thought I would share some family birthday traditions that we have: we drink a lot, we give cheap gifts, and we always give all the left-over cake to me. What? I swear these are legit birthday family traditions! Maybe. When I married my wife, I had no clue that I was gaining a sister as well. But nothing has given me more joy than having you in my life. If you ever need an older brother to help adore and support you, just call on me, and I will be there. Happy birthday Sister-in-Law! Sister-in-Law, you always bring happiness and joy to everyone who is fortunate to have met you. I am still not sure what possessed such an amazing person to marry into our crazy family but believe me when I say that I am so very glad you did! You have a special place in my heart, Sister-in-Law, because you make my brother more tolerable, me more responsible, and our family more incredible. Thank you, and happy birthday! My brother may be proud to call you his wife, but nothing compares to how proud I am to call you my sister. You are profoundly kind, perfectly adorable, and infinitely lovable. May your year be full of many blessings and your life full of happiness and joy. Sister-in-Law, my brother seems to think that I am afraid of commitment, but that is so untrue. I am 100% committed to your birthday cake! Its sweet chocolatey gooeyness is my everything. You are pretty awesome too, and I hope you have a happy birthday! I have a special treat for your big day, Sister-in-Law: I have gathered all the most embarrassing photos of my brother that I could find, and they are all yours for future ammunition for when he is bound to annoy you. You are very welcome! Sister-in-Law, we disagree on almost everything, but there is one thing that we can agree on: that you are a spectacular sister-in-law who I am blessed to have as a part of my family. May your day be delightful and your life full of love. Happy birthday! I like to treat you just like a real sister: I annoy you, I admire you, and I love you. I am fortunate to have such a deeply loving person in my life, and I hope you have a great birthday. Sister-in-Law, you always shine brightly no matter the situation, and I just wanted to take the time to thank you for always making me smile. Your joy is infectious, your positivity is marvelous, and you are downright fabulous. Happy birthday! I really enjoy having you as a sister-in-law. You’re a kind person, a wonderful friend, and more importantly, you’re a phenomenal cook! The holidays have been so much more enjoyable (and scrumptious) since you’ve become a part of our family. Thank you. My brother must have saved a kingdom in a previous lifetime to be blessed with such amazing women in his life. First, he has an awesome mom, then he has a fantastic sister, and finally, he has a stunning wife. May your birthday be full of girly giggles, and throaty laughter. Thank you for giving me something that my parents never did: a sister. You mean so much to me and are an invaluable part of my life. May your birthday magical and bright. Sister-in-Law, unlike my brother, you are wise, thoughtful, and sensible. So, feel free to set me up with any of your friends at your birthday party, because I trust your judgment. What? It’s a compliment. I swear! I hope you have a fun and joyous birthday. For all the times I needed a sister to wipe away my tears or share in my laughter you were there for those moments. Thank you, and I hope that you are smothered in love, kisses, and adoration on your big day. Happy birthday Sister-in-Law! Since you have become a part of our family, you have brought only happiness and wonder into our hearts, because you are such a dependable, remarkable, and lovable person. I never thought I would see the day when my brother would be head-over-heels about someone. But then I met you, and I realized why he was that way: because it’s impossible not to love you. Happy birthday to my extremely lovable sister-in-law! Sister-in-Law, we may have opposing opinions on a lot of things, but there is one opinion that we both share: you are an incredible person who is a vital part of this family. May you feel sheltered, loved, and adored on your big day. Sister-in-Law, you remind me a lot of Sandra Bullock: you’re pretty, you’re smart, and you’re “Miss Congeniality.” Also, you never seem to age. How do you do it? No, really. How? Please feel free to share both your cake and your beauty tips with your adoring sister-in-law. Do you know what’s funny? When I think of my brother, I tend to laugh, and when I think of you, I tend to smile. You guys really are perfect together. You are a wonderful addition to our family, and I hope that your special day is as lively and fun as you are. Sister-in-Law, if life were a cookie, you would be the chocolate chips, because you make everything better with your sweet, adorable, and loving nature. Happy birthday! You are such an unselfish, compassionate, and loving person, Sister-in-Law. Honestly, I’m not sure how my brother landed such a catch! But I am glad he did because it enabled us to become such good friends. May your birthday be full of many amazing memories. I am so thankful that you are now my sister-in-law, and I look forward to all the things that I never got to do with sister when I was younger: bonding, chatting, sharing secrets, and more importantly, talking a lot of smack about my brother! Happy birthday to my new sister! A miracle has happened: I agree with my brother for once! He thinks you are perfect, amazing, and glorious, and I happen to concur. Now if only I could get him to agree to the fact that I am also all those things! Oh well. Happy birthday to my incredible sister-in-law! I’m very fortunate because good friends are often hard to come by, but you just fell into my life when you married my brother. I want you to know that I feel privileged to be your friend, and I hope that your birthday is exciting, joyous, and very special. My brother is either supremely lucky or a lot more intelligent than I give him credit for because he managed to con you into marrying him. Honestly, I’m leaning towards luck, because he wasn’t all that bright as a kid! Either way, we’re both blessed to have you in our lives. Sister-in-Law, if you are ever feeling troubled, please know that I will always be there for you. I consider you to be my real sister, and I will always support you no matter the circumstance (and I know that you would do the same for me as well). Happy birthday, Sis! Happy birthday to my sister-in-law who I truly adore! Now that we are sisters you will never need another birthday present, because what could ever top being related to me? Sister-in-Law, you’re doing a great job of making marriage look easy and effortless, and I must say I’m impressed. Although to be fair, I’m more impressed by the fact that you haven’t killed my brother yet! Happy birthday from your truly astounded sister-in-law! I hope you know that it’s never too late to become who you want to be in life. You have unlimited potential, and I know that you can do anything you set your mind to. May this birthday be the start of a beautiful beginning, and may you receive ungodly amounts of cake! We may not have started out as the best of friends, but I’m so grateful that life brought us together so that we could end up as sisters. Happy birthday, Sis! 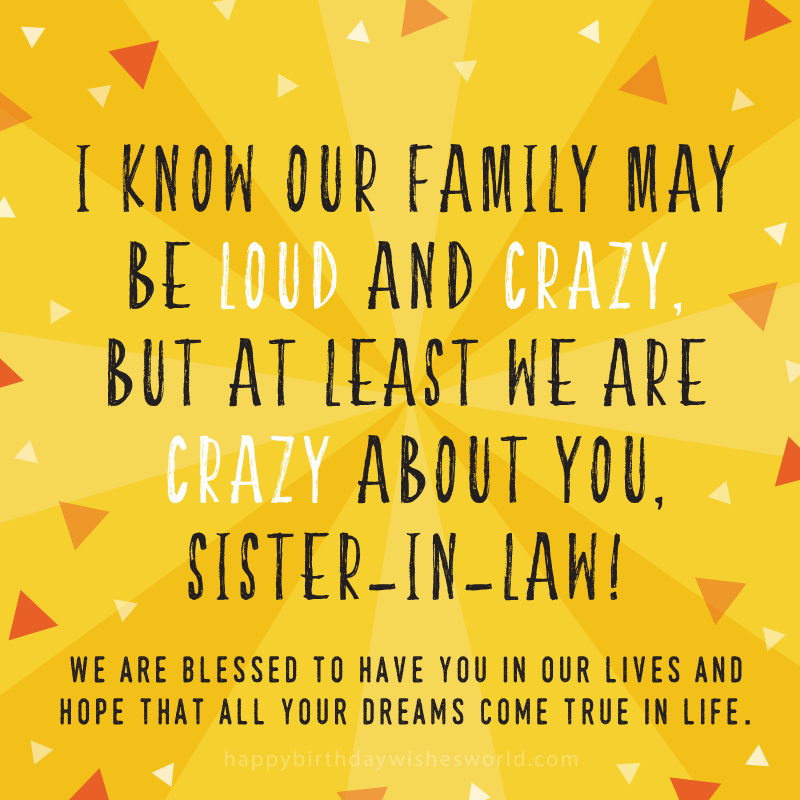 I know our family may be loud and crazy, but at least we are crazy about you, Sister-in-Law! We are blessed to have you in our lives and hope that all your dreams come true in life. Sister-in-Law, I have a confession. Sometimes, I fake being upset or sick so that you will pamper me with your love. I know it’s wrong, but I can’t help myself. You are so amazing, so who wouldn’t want to spend time with you? If you are ever wandering alone in the darkness, you can call me, and I will be the light that helps to guide you home. I consider you a sister, and therefore it’s my job to make sure that you always feel loved, supported, and guided in life. Happy birthday to my little sis! You’ve brought so many wonderful things into my life: sisterhood, friendship, and love are some of my favorites. I hope you have a lovely, lavish, and light-hearted birthday. I normally question my brother’s sanity, but then he married you. He must not be as crazy as I thought he was, because you are gorgeous, cheerful, intelligent, and personable. We are both lucky we get to call you family. Happy birthday Sister-in-Law! You’ve improved my brother’s life with your love and devotion. Personally, as his big brother, I feel that he doesn’t deserve you. Now, if I could just find a wife half as wonderful as you, I’d be set. If only you had a sister. Happy birthday from your very jealous brother-in-law! I love having you as a sister-in-law. I couldn’t ask for a better person to share all my troubles, hopes, and dreams with. You have a kind nature, a beautiful soul, and a loving spirit. May you feel just as loved and cherished on your birthday as I do by you in life. Thank goodness my brother married you because now his kids have a chance at being cute! What? It’s a compliment! Happy birthday to my cute, pretty, and gorgeous sister-in-law! Since we are “sisters,” we ladies should band together. In that vein, I say that we band together in throwing my brother in the pool at your birthday party. Good plan? I think so too! May your birthday be full of endless fun, deep laughter, and enveloping love. A lot of people have a love/hate relationship with their in-laws, but I am fortunate in that we will only ever have a love/love relationship. Happy birthday to my loving sister-in-law! You are an important part of not just my brother’s life, but mine as well. I can’t imagine not having such an amazing, awesome, and astonishing “sister” in my life. Thank goodness I don’t have to! May your birthday be full of grand and delightful moments. Now that you are my sister-in-law, I get to look forward to all the crazy times we will have in the future. Just so you know, I would prefer crazy times in Vegas over crazy times during family dinners! Just saying. Here’s to a lifetime of crazy strong sisterhood and love! While I may be gorgeous, witty, smart, and adorable, you are too! Since we are both so awesome, this must mean that we were destined to be sisters. I’m so glad we are well-suited, and even more glad that we have the rest of our lives to be besties. Sister-in-Law, from one mom to another: I’m impressed. You manage to get everything done and look fabulous while doing it. Please tell me your secret! May your birthday be as perfect as you are. Happy birthday to my impeccable sister-in-law! Today is more than a celebration of when you were born. It is a celebration of the wonderful life you have lived so far. May you continue to have bright and happy days. I am surprised and beyond pleased with how we have become such good friends throughout the years. Thank you for all the great moments we have had so far, and I look forward to having many more with you in the future. Happy birthday Sister-in-Law! My brother may have gained a wife, but it’s I who gained both a sister and a best friend. Just remember, that while we both appreciate and love you, that I am the one who baked your birthday cake. Just saying. Happy birthday to my darling sister-in-law! We may have only known each other for a short while, but in that time, I have learned so much from you. You are always eager to lend a helping hand, and your kindness, compassion, and love always make me so very grateful that I get to call you my friend. There is no greater compliment that I can give other than to say that when my daughter grows up, I hope that she takes after you: strong, vivacious, intelligent, caring, and full of love. Happy birthday to the woman I am proud to call a part of my family: my sister-in-law! Sister-in-Law, we had some rough times at the beginning of our relationship, but now there is no one I would rather have as a friend than you. We probably needed some time to figure out how good we are together because we are so much alike! I’m astounded that my baby brother managed to get such lovely, gentle, and intelligent woman like you to marry him. Tell me truthfully, did you take pity on him because he is super lame? Regardless, I am so thankful, because you are one of my nearest and dearest friends. I want to thank you for always acting like an older sister to me, and for taking the time guide me every step of the way in life. I’m so appreciative, and I sincerely hope that you have a spectacular birthday this year. Happy birthday, Sis! We may be different in many ways: different viewpoints, different personalities, and different beliefs. But there is one way in which we are completely the same: we both love and respect each other regardless of our differences because family always comes first. You never fail in being kind, steadfast, and loving. This is just one of the countless reasons I love you so much, Sister-in-Law. I’m sending hearts, hugs, and kisses your way today. Always keep in mind that when you married my younger brother, you gained a big brother as well as a husband. So, if anyone ever bothers you or hurts your feelings just let me know. It will always take care of it for you. Happy birthday to my cherished sister-in-law! We may not be related by blood, but we are related by love. I consider you to be the sister that I wasn’t blessed with during childhood, and I want you to know that I will always be here for you no matter what. May you feel nothing but love and contentment on your big day. Thank you for being such a giving, loving, and nurturing person. You are a constant source of pride and joy for our family, and we are lucky to have you. Happy birthday Sister-in-Law! I may not be able to be there with you on your big day but know that your friendship and love are a crucial part of my life. I wish you untold happiness on your birthday, and when I get back I promise that we will party it up to make up for my absence! My brother’s taste is normally questionable, but I guess people can change. I mean, he married you, and you are simply amazing! Either that or he just lucked out. Hmmm. It might be that last option. Regardless, happy birthday to my immensely amazing sister-in-law! There are so many things to admire about you, but your grit and determination are some of my favorites. Happy birthday to a woman I love as much as I admire: my sister-in-law! When I married your brother, I had no idea that I was also gaining a bestie for life. From luncheons to shopping to play dates, we have always bonded. I want you to know that I feel unbelievably fortunate that I married into your family. Having you as a sister-in-law has made me a stronger person because your faith in me gives me strength. Your support means the world to me, and I hope that your birthday is full of happy surprises, yummy food, and so much love that you are overwhelmed by it.